Quality Insight at the Point of Production - CMM Inc. 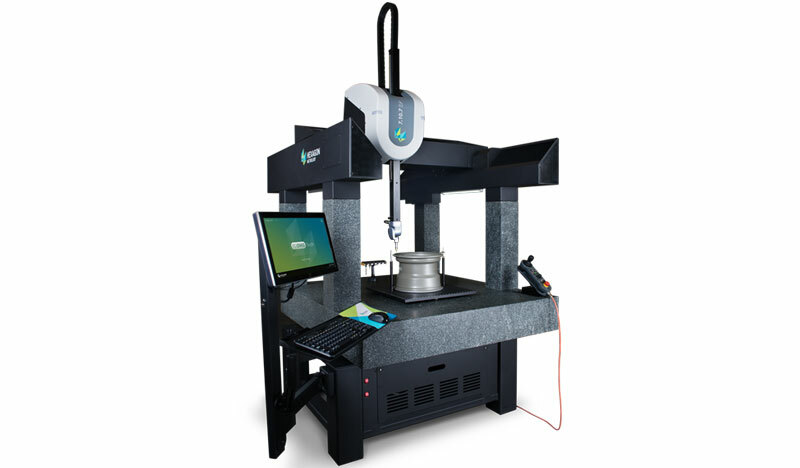 The Hexagon 7.10.7 SF is a rugged and robust coordinate measuring machine designed to excel in tough environments. It has been designed by drawing upon the experience of over fifteen years of shop-floor machine production experience and thousands of units in the field worldwide. This rugged CMM is ideal for machine shops and manufacturing cells it features advanced thermal compensation, covered ways, built-in vibration resistance, shop-hardened design, and optional contact analog scanning. With no shop air required, the 7.10.7 CMM offers a flexible solution for dimensional inspection at any stage of the production process. In addition to the hardware, the revolutionary PC-DMIS Touch software greatly enhances the user experience. It enables users of the 7.10.7 SF to run inspection programs via a touch-screen interface that requires very little training. Together, they offer immediate quality control visibility to help identify and react to process variations, reducing scrap and increasing productivity. Economical to own and operate, with low up-front cost and simple maintenance, the 7.107 SF is every user’s dream.